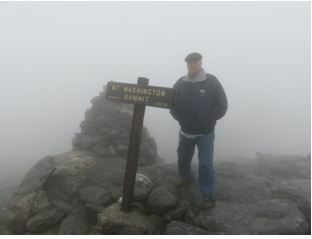 This trip will be our third attempt to assault the summit of Mt Washington. This trip was planned specifically to accomplish the task of reaching the summit. 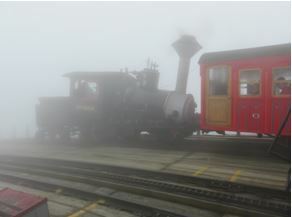 The previous two attempts were scuttled due to bad weather on the mountain. The drive up to Bartlett, NH promised to be potentially rainy. 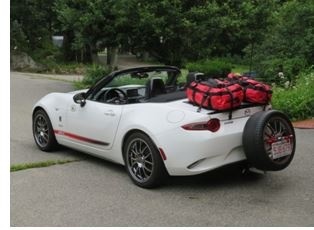 It started out great with tops down but soon turned to showers. Then rain. Then down pours. 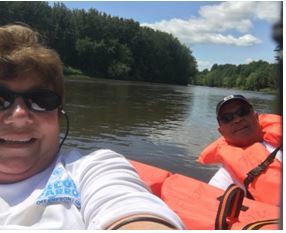 Judy & I persisted with top down until we were forced to slow down and put the top up out of fear of filling the interior of our car with water. Once we reached Lincoln, NH the rain subsided while we ate lunch at the Black Mountain Burger Company. Following lunch we headed across the Kancamagus Highway and Bear Notch Road. Great twisty roads until some people ended up with a “going to church on Sunday in my Subaru” driver. Even though it was Saturday. 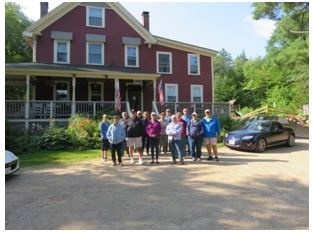 After checking into our rooms at the inn we regrouped and headed to the Mt Washington Auto Road for what promised to be a great climb up the mountain with the New England Mazda Auto Club. We were to have the Auto Road all to ourselves both up and back down. Mother Nature had other plans. 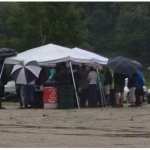 Torrential down pours, flooding and lightning forced the Mt Washington people to close the Auto Road. This made for our third failed attempt. Sunday brought a beautiful sunny day. We headed out for some twisty fun on Tin Mountain Rd, Switchback Rd. (thanks Brenda), Thorn Hill Rd and finally Hurricane Mountain Rd. 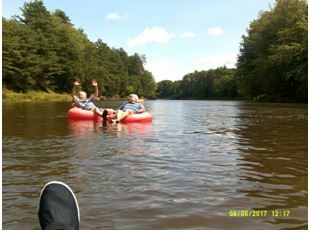 From there we had planned an all out assault on the Saco River with 20 people in tubes. A few of our hardy crew backed out thinking it was going to be too cold! 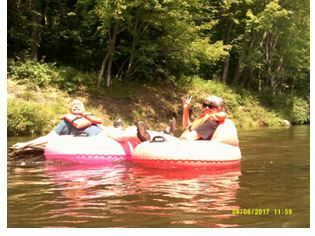 The rest of us forged on and had a great few mindless relaxing hours floating down the Saco in inner tubes. The water was fairly warm and the sun was hot causing many to end up with some very red body parts. 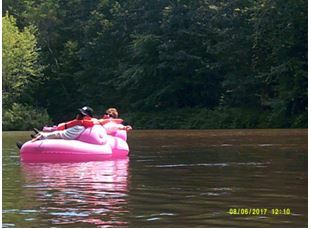 All had a great time except for a few folks who insisted on grabbing the big pink tubes only to find out their arms were not long enough to reach the water to paddle causing them to be frequently stuck in the weeds on the banks of the river. No names included. Look for the big pink tubes in the photos. Sunday night we all convened to go on a Moose Safari. Unfortunately the bus never showed up. First Moose Safari attempt failure. Not due to weather. 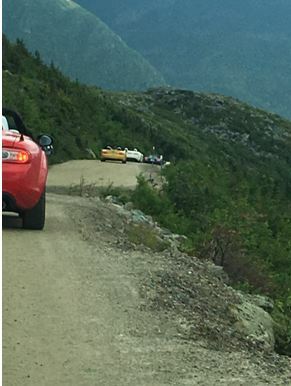 Monday we altered our plans and headed for Mt Washington Auto Road for our fourth attempt at the summit. Nice sunny day. Off we go with Jack & Judy leading the way to the top. All good for 2/3rds of the way up. Then there was this cloud stuck on just the top of Mt Washington. No where to turn around so we kept going with only about six feet of visibility. We crept to the top following the yellow center line on the road. Fortunately those coming down were doing the same so there were no collisions. Once we all got to the top and found parking spaces we formed a group to search out the stairs from the parking lot to the summit buildings. It was a good thing for railings on the stairs to keep us in line. 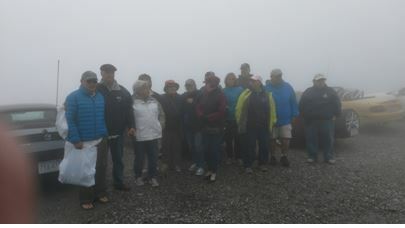 We spent some time at the top taking foggy pictures of people standing next to the summit sign and rock pile. Once we found our cars again we attempted a foggy group photo shoot and then headed back down the Auto Road. Once out of the clouds we picked up the pace to the bottom. 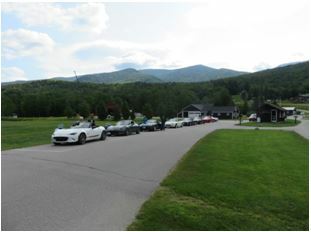 We had lunch at the Glen View Café across Rt 16 from the Auto Road and then headed out on the northern route around the Presidential Range stopping in Sugar Hill at Harmen’s Cheese Shop and then on to the base station of the Cog Railway for a rest stop and to explore the area. Then back to our inn. Monday night the Moose Safari bus promised not to forget us. We packed into the Moose Safari Bus and off we went to find moose. Our guide insisted we saw five moose but we really think several times it was the same moose. Any way. We did see the back end of more than one moose. Monday was time to head towards home. 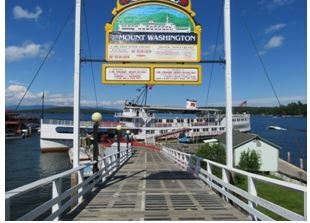 We caravanned from Bartlett down to Weirs Beach where we boarded the M/S Mt Washington for a Lake Winnipesaukee cruise and lunch. The cruise was nice and the weather was perfect. Following the cruise we went up the street for an ice cream sundae to make sure the trip was complete before heading for home. All in all a pretty successful trip and plenty of adventures to remember. Thanks to all who joined in with us.